it’s here again. 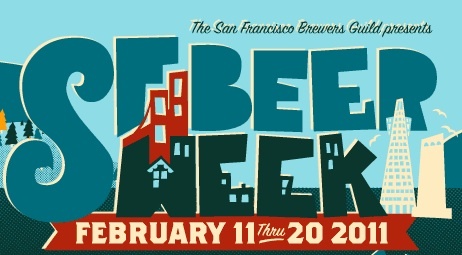 San Francisco Beer Week. there’s too much to do and too much to see and too many beers to drink in just one short 10 day week. the only way to make it to the end is to go in with a plan. honestly, if you stick to what you start with everyone will be amazed. there’s lots of tools to help you plan on the website. there’s a calandar, an iPhone app, there’s twitter. the solution to that is to go late. or get there early. we are fans of the Barley Wine Festival at the end of the day. it’s a crush during the day in a way that makes it unfun even if you have a team helping you retrieve and try 60 different beers. beer dinners always sell out. so if you were waffling about what to attend now is the time to make the reservation. beer pairing dinners are often epic events. often you’ll get to taste that nobody else will get to try. and because it’s special beer the food that goes with it will be extraordinary. the downside (if there was a downside to food) is that the dinners can be long even though they tend to start early (6-7PM). drink water. there are some people that say you should even the score. one beer followed by one water. this can be too much. sometimes it’s better to just have a water because you feel like one not because you are keeping score. but no matter what, don’t forget to have some H20. take time off. yes, there’s a need to be part of every single day because you don’t want to miss anything. but taking breaks will help you. not to mention your pocket book. don’t drive. please. don’t. BART, bus, cab, train, street car, cable car or find a DD. taste instead of drink. it’s a mind set that makes you want a whole pint of beer. but this week it’s about a different experience as everyone is bringing out all these special things. tasting beer is different than committing to a whole pint. it’s about turning on your senses to enjoy the aroma, mouth feel and tastes. taking notes and pictures will help you remember what you want to get back to when the event is over. take pictures. the week will be a blur but the camera will capture it. we’ll put the pictures that we snap during the week as posts to so you what you are missing. in case you need more tips here’s our previous post about SF Beer Week.